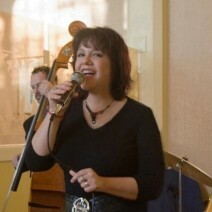 Vocalist Vicki Burns is a jazz singer who has been delighting audiences for years. A vocalist with a sure sense of rhythm and tone, she infuses each song with heartfelt expression, digging into the lyrics and melody for their richest interpretation. The great jazz drummer, Max Roach once described Vicki’s singing as “…a goldmine…!” Jazz critic Scott Yanow says, “Vicki Burns has a limitless future. Her very attractive voice, versatile style and infectious delivery combine to give her her own memorable sound.” John Gilbert of ejazz.com says: ”Vicki Burns does indeed ‘burn’ on this recording. The stars were aligned just right when she was blessed with a singing voice that was made for the jazz idiom.” Active in the New York City jazz scene, Vicki has recently performed for enthusiastic audiences at Birdland, The Iridium, Zinc Bar, North Square and the Metropolitan Room, among other venues. Vicki has been teaching children and adults to sing in both private lessons and classes in school settings since 1984. Previously to teaching with New York Jazz Academy, Vicki enjoyed teaching at Blue Bear School of Music in San Francisco, which features American styles of music such as rock, blues and jazz, from 2003-2008. Vicki teaches a vocal technique which is based on the Classical technique of Bel Canto which she has adapted to popular styles and all ages, ranging from 3-90!